2012 was a great year for Nottingham, not the least because the City was proud to be part of the Olympic Torch route around the UK ahead of the London Games. 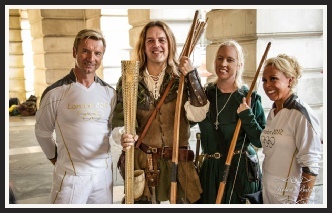 On 25th June the torch was carried in to Nottingham’s Old Market Square by Olympic gold-medal winning skaters Jane Torvill and Christopher Dean before being brought onto a huge stage in front of the 16,000+ people there to cheer it on and enjoy the spectacle and entertainment. We were there onstage and were very pleased to take part and support the Games and our great city! Photo courtesy Robert Balmer Photography. To celebrate her Golden Jubilee Her Majesty the Queen, along with Prince William and Kate Middleton visited Nottingham to dedicate a new park named after her. 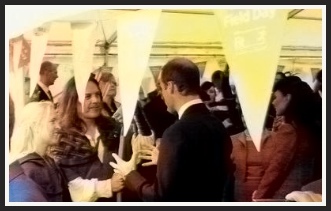 We were lucky enough not only to be at the event but also to meet and talk with the Duke and Duchess who said they’d been hoping to meet Robin and Marian on their visit so they were very pleased we were there! As Nottingham’s official Robin Hood I’ve also had the honour of meeting Princess Anne and the Duke and Duchess of Gloucester at events in the city - although I’m still waiting for a royal pardon! NOTTS TV’S ‘DAY IN THE LIFE’ DOCUMENTARY ON US! Notts TV is the city’s brand new television station and as part of their original programming have produced a brand new documentary series, ‘A Day in the Life’, showcasing lives in and around the city and Episode 5 featured us as the city’s Official Robin and Marian, preparing for and performing our Robin Hood Plays in Nottingham’s Market Square. More details on Notts TV HERE. Below right: I recently joined forces with the real Sheriff of Nottingham, a backing choir of Traffic Wardens and some schoolchildren to sing (yes, sing) on a video for Nottingham City Council's 'School Keep Clear' campaign - it was great fun but I’m not convinced I’ll be in ‘Robin Hood: The Musical’ anytime soon! In 2013 Tim and Sally were guests of honour on a visit to the beautiful German town of Hamelin, helping celebrate the 200th anniversary of the Brothers Grimm fairy tales as the historic town held a summer-long festival of stories, myths and legends - and we were invited to take part in the first and largest event. We told stories, gave interviews, visited schools and the children’s hospital, took part in two huge shows for thousands of visitors from all over Germany - and as you can see also took part in a car rally! 18th June 2012: Art Attack! In June 2012 Robin met Corporal Derby, a ram who is the Regimental Mascot of the Mercian Regiment (and Honourary Freeman of the City) along with his handlers at the Nottingham Contemporary Art Gallery as we toured the City with other Freemen. That’s some quality surrealism right there, I reckon! 12th May 2010: Fighters Unite! In May 2010 Nottingham was chosen to host a special gala screening to coincide with the Cannes Film Festival Premiere of Ridley Scott and Russell Crowe’s epic movie ROBIN HOOD. Tim as Robin and Sal as Marian were invited as special guests along with a host of Nottingham celebrities and VIPs, including champion boxer Carl Froch, who has just won the WBA Super-Middleweight Championship to compliment the IBF title he already holds. Pictured are Tim, Carl and Carl’s lovely wife Rachel. Congratulations, Carl! Tim was featured as Robin Hood on the very popular Australian Channel 9 ‘Getaway’ travel show’s ‘At The Movies’ special. Quake in fear at the fabulous sword fighting scene with Jules the host and Tim matched in mortal combat! Very early in the morning on a very cold day last November the brilliant ‘Rickshaw Challenge’ team set off from their overnight stop in Nottingham. The Challenge has a group of inspirational young people pedaling a rickshaw from Manchester to London to raise money for and awareness of the BBC’s flagship charity’ Children in Need’. Along with ‘The One Show’ TV presenter Matt Baker, Jess the rider and a very enthusiastic support and camera team Tim was asked to appear as Robin to help see them off in style!